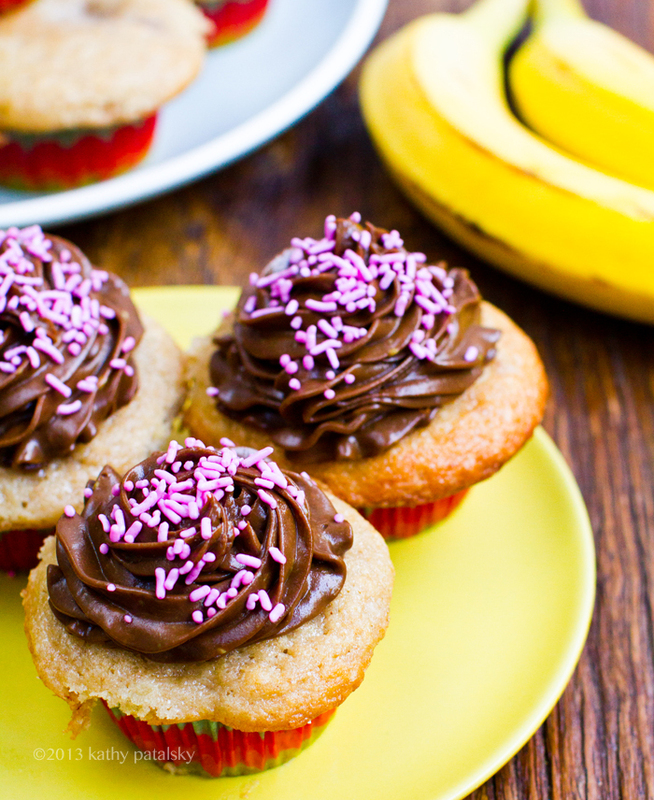 Chocolate Frosted Banana Cupcakes. Vegan Valentine's Day! 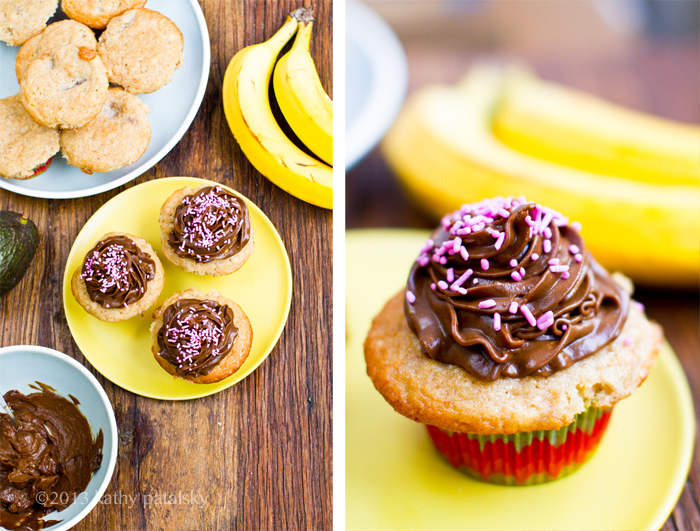 Chocolate and banana is one of my favorite flavor combinations, so this Valentine's Day I wanted to share a super yummy, dreamy recipe for vegan Chocolate-Frosted Banana Cupcakes. 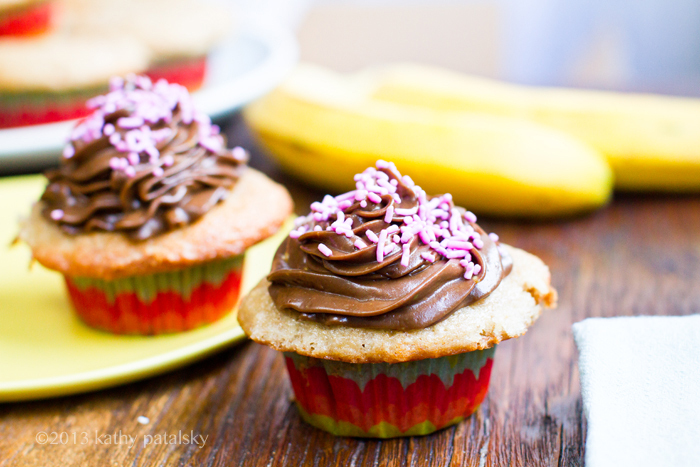 The avocado-based frosting is silky smooth, swirled on top of sweet, moist, fluffy banana cupcakes. Add some pink sprinkles on top for the perfect Valentine's Day accent! Plus read my 'question of the day' thoughts on using the word "vegan" (or not) in brand messaging..
Cupcakes. The frosting reminds me exactly of that creamy chocolate filling that I used to find in those oh-so-popular childhood chocolate hand pies. silky, yet rich and light - like a mousse or fluffy rich pudding. But just sweet enough to work as swirlable frosting. 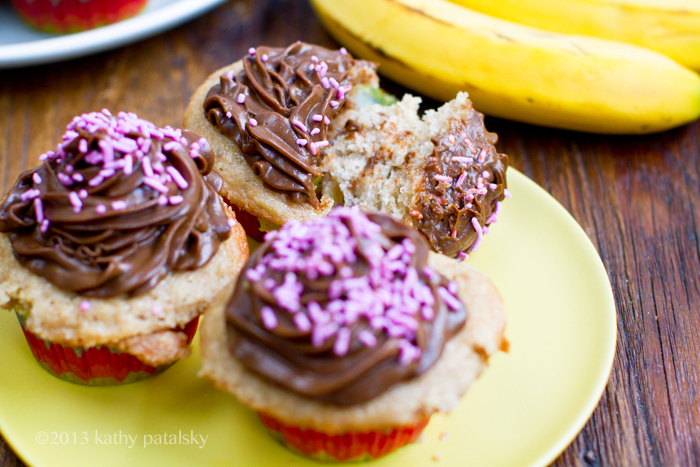 The banana cupcakes are moist and fluffy. 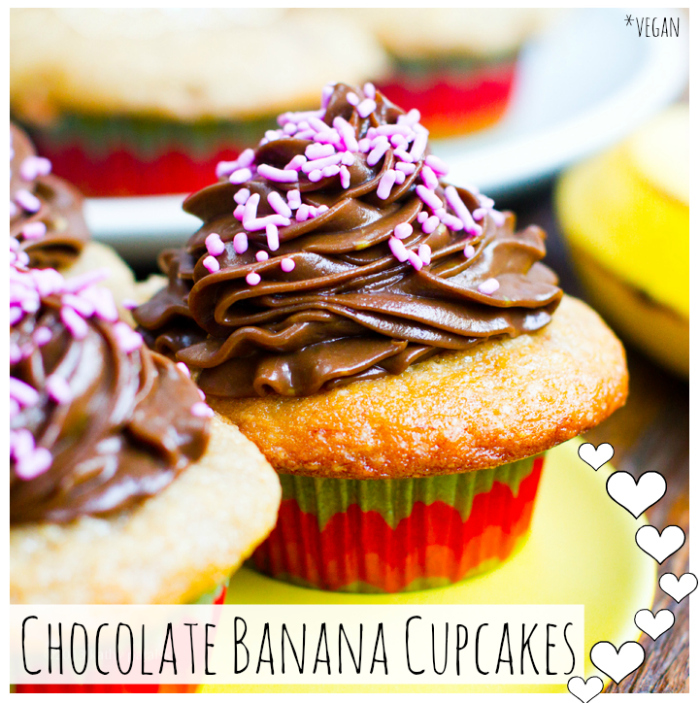 They taste like a vanilla cupcake meets the best homemade banana-y banana bread ever. A hint of cinnamon is nice. 1. 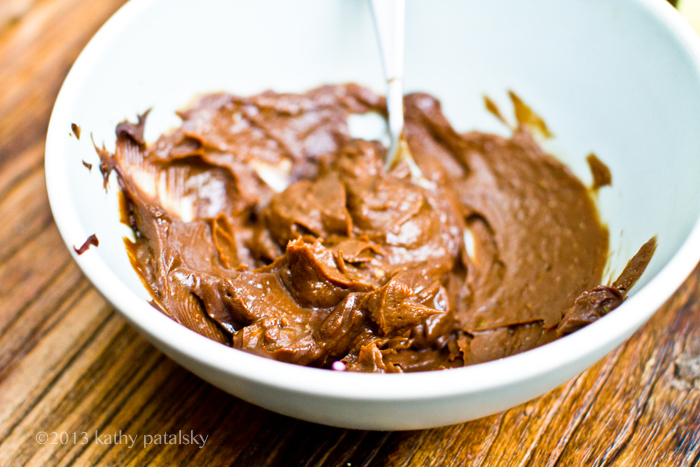 Combine all frosting ingredients in a blender or food processor, blend until smooth. Tip: Add all ingredients except powdered sugar and cocoa powder first, blend until silky, then slowly add in the dry components. If your blender sticks, then you can now pour into separate bowl and beat or fold in additional powdery ingredients. (you could also just beat, but will not be as smooth) Place frosting in fridge to chill. 2. Preheat oven to 350 degree. Combine flour, salt, baking powder and cinnamon ingredients in large mixing bowl. 3. Add the almond milk, vanilla extract, oil and vinegar to the bowl and beat on low until smooth. 4. In a separate small bowl, mash the bananas and sugar together until thick and clumpy yet smooth and spoonable. 4. Stir in the banana sugar mixture. For extra smooth cupcakes you can beat on low for a second time. 5. Line or grease cupcake tine and fill tins almost all the way if you want that spread-looking top. 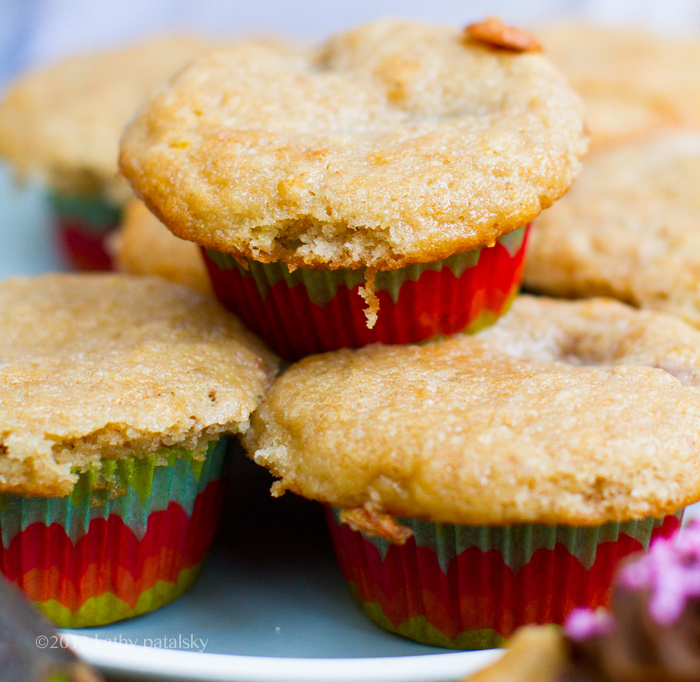 For cupcakes with less of a spread top, fill 3/4 of the way and expect to get more cupcakes than 12. 6. Bake at 350 degrees for about 20-25 minutes or until center of tops becomes cake-y to touch. Remove from oven and cool. 7. 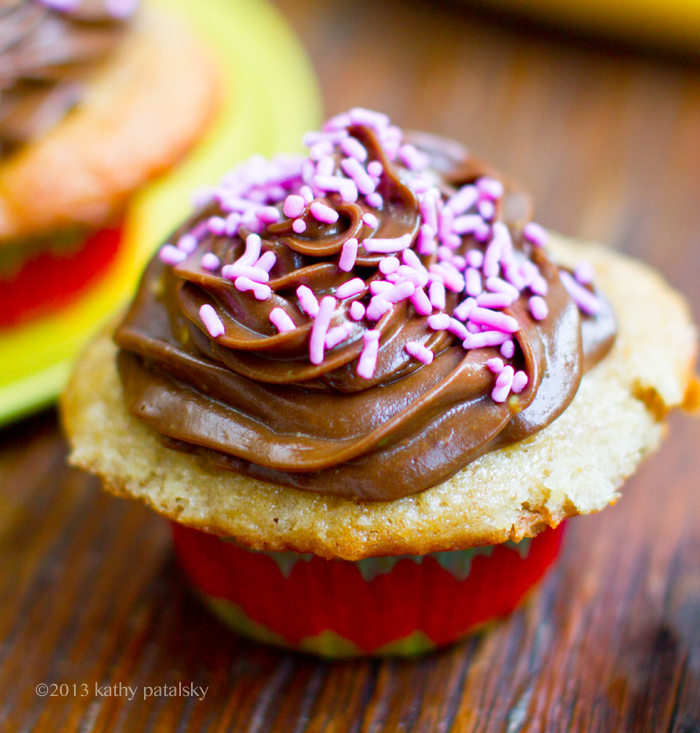 When cupcakes are cool, grab your frosting and fill a frosting tip (or just frost using a spoon, either way works). 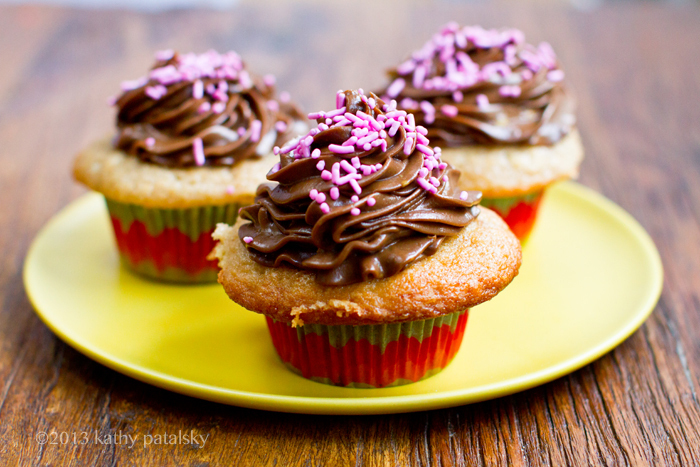 Tip: Warm frosting in microwave for 5-10 seconds if the fridge made it a bit too firm. You can also remove the frosting from the fridge a good twenty minutes before planning on frosting if you are worried about the texture. The coconut oil in the dressing is what firms it up in the cold environment (but it is also what makes it so buttery and rich once it warms a bit)! 8. Serve and store on counter top, in a sealed container for up to one day. After than, store cupcakes in the fridge. 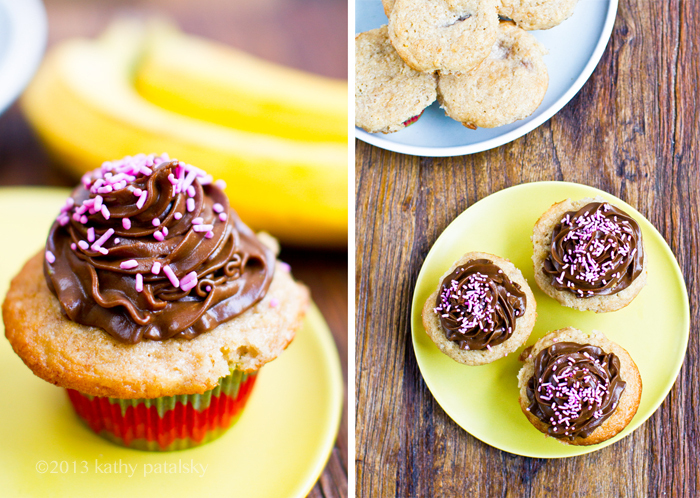 Tip: These cupcakes taste best the same day you make them! So be sure to have a crowd to feed! 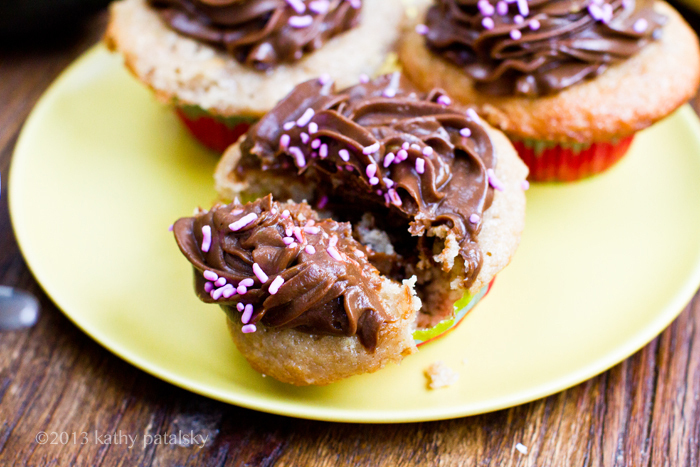 You could also halve the cupcake batter recipe and keep the frosting as is in size. Leftover frosting can easily be consumed as a rich chocolate pudding. If I called these cupcakes: Vegan Cupcakes. 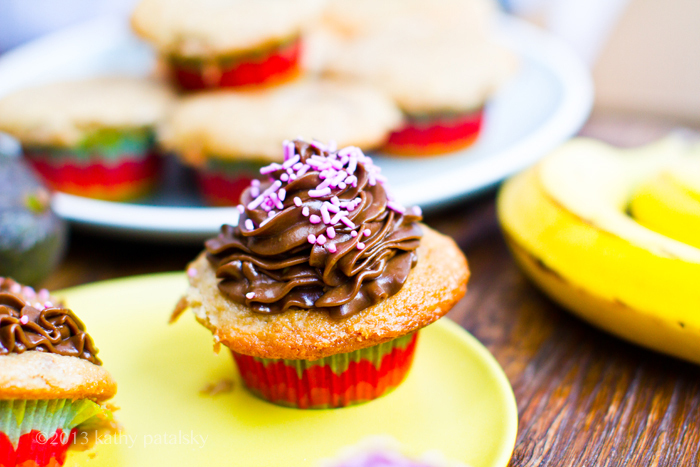 Plant-Based Cupcakes. or Cupcakes... ? I have been thinking a lot about the word "vegan" lately and how it is used to market products and describe recipes. And how in many cases, the word vegan is hidden from branding, in fear that the term will scare off non-vegan customers. This question carries much weight to me, as someone with a book coming out with the word "vegan" in its title. My book "365 Vegan Smoothies" could have easily been called "365 Smoothies" but I was very firm that I wanted the word vegan on the cover. But I also know that MANY of my readers are not vegan. And I love that! I love when they see recipes on my blog and comment that they had no idea "vegan" food could look and taste so amazing. Or that they are excited to do a "vegan night" once a week even though they are not vegan. All this means that the image of the word vegan is changing for the better! "If you use the "vegan" word, there's more than just the food attached to that. For non-vegan people, there's kind of a feeling that vegan eaters aren't tolerant of what other people eat. It's a lifestyle; it's not just a food." This quote stood out in my brain for a number of reasons. At first, I totally agreed! And I loved the way he spoke. But then this morning I woke up not able to get that quote out of my head. He is right. Veganism DOES communicate more than food. But to me, the values "vegan" communicates are qualities like love, compassion, kindness, awareness and love of animals. All things I am most proud of in my own personality. To me, the word vegan communicates positive things. My vegan and vegan-curious friends are all kind, animal loving, intelligent, thoughtful, curious and inquisitive people who care about the earth and the people, plants and animals on it. Hiding the word vegan feels secretive, almost reminiscent of the cooking controversy when parents contemplated the practice of secretly adding veggie purees to their kids meals. Sure, it gets the job done, but is teaching anything? That veggies CAN taste good? Hm, is the word "veggies" to a 5 yr-old equal to the word "vegan" to the general public? Well, maybe. Some 5 yr-olds (I have met them!) actually LIKE (some) veggies. So while the stereotype is seemingly that kids hate veggies, many parents have somehow miraculously broken down that wall. "Veggies" doesn't have to be a bad word. The same goes for "vegan" + food. But back to my point.. I get it. Greg's quote. And quite honestly I have no problem with Veggie Grill or any other restaurant not using the term vegan in their marketing materials. As a customer, I could care less if they use the word vegan. I just want the product to be amazing .. and it is at Veggie Grill! BUT their reasoning behind it does make me think. And I hope this little blogpost makes you ponder it too. And if any vegan companies read this, I hope they know that the term "vegan" to some people out there (okay, ME!) is a very positive thing. As a business owner.. reading Greg's quote, at first, worried me a bit. Here is a very successful CEO with probably many consultants and such backing up his marketing stance and he says "vegan" is bad to use. But then I started to look around and see how many vegan companies and brands are thriving. My bloggy friends Meet the Shannons ... Annie and Dan Shannon's new book Betty Goes Vegan is (today) number one in reference cookbooks on Amazon. And the amazingly talented Chloe Coscarelli has a new book out called Chloe's Vegan Desserts that will no doubt do AMAZINGLY on the book charts. And lastly, the very talented vegan designer Leanne of Vaute Couture just had her "vegan" fashion showing at Fashion Week NYC yesterday! Read my Veggie Girl Power interviews with: Annie, Chloe and Leanne! ..So there. Maybe "vegan" and all that goes with that word doesn't have to be so secretive. Now. What do you think? The books I chatted About. Snag Chloe and Annie & Dan's books on Amazon..
* Chloe's Vegan Desserts: More than 100 Exciting New Recipes for Cookies and Pies, Tarts and Cobblers, Cupcakes and Cakes--and More!